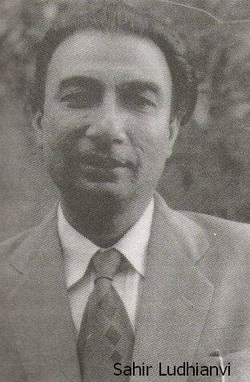 This website is dedicated to Sahir Ludhianvi, one of the greatest poets and lyricists of India. I hope, in some small measure, to share the pleasure I have received in reading and listening to his poetry and songs with his legions of fans and introduce him to those who may not have had the pleasure of knowing his body of work. My love for his songs has only deepened over the years and so has my appreciation for his poetry. You can browse through Sahir's poetry at our sister site, Urdu Poetry Archive. Also, check out our series - "Sahir Ki Yaad MeN" where we showcase his songs and poetry. Sahir's works, his poems and his songs, are presented in romanized or transliterated Urdu. The transliteration scheme can be found on the Urdu Poetry Archive web site - Transliteration Scheme. Feel free to Contact Us with your suggestions and feedback.